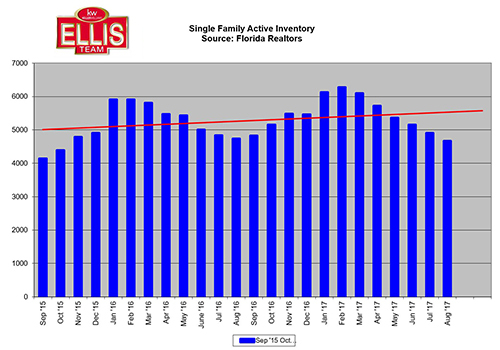 Official SW Florida real estate statistics were just released for August and one thing that stands out to us is the drop in inventory. This leads us to believe now is an excellent opportunity to sell SW Florida real estate after Hurricane Irma. Inventory was falling pre-hurricane Irma. We suspect some homes on the market were damaged. If 4,666 were on the market prior, and assuming 10% sustained damage, that would take us down to 4,200 homes. Additionally, there are many displaced homeowners and renters in the Bonita, Buckingham, and San Carlos areas that need housing. Flooding was an issue in these areas and some homes are uninhabitable. After Hurricane Charley in 2004 we saw an increase in home sales. Buyers competed for properties because people needed housing. The same scenario could very well play out in 2017. Our phone has been ringing from buyers and investors looking to purchase. We filter out the sharks that want to come in and buy up property for pennies on the dollar. They are unrealistic and they do not care about people. They seek opportunity. Perhaps there will be opportunity for them with the flooded out and heavily damaged homes. We focus on homeowners and investors who acknowledge there is a need for housing and are seeking solutions to meet that need. If your home in uninhabitable, you need housing now. They need a home that meets their needs, and they can’t be choosy if it has everything they’d want. Some homeowners may decide they’ve had enough. Owning a 2nd home and preparing for storms can be tough, especially if they find they’re just not using and enjoying the home right now like they thought they would. Circumstances change. Other buyers are looking to purchase here because they’re at a point in their life where they will come down and enjoy the home. Enjoying a 2nd home is a cycle, and depending where you are in that cycle makes all the difference whether it’s a good time to buy or sell. If you own a home and you’re thinking of making a change, please call us at 239-489-4042. Ask for Sande or Brett. We’ll be glad to walk you through your options. We can tell you how much we can sell your home for, and how much you would net at the closing table after paying off all mortgages and expenses. Then you can decide if it makes sense to sell. Or, you can see how much your home is worth online for free! Selling is more fun when there is less competition from other sellers. We have low inventory right now, and in about a month we’ll see if we lost more. Demand probably just picked up as well, so a hurricane can be a perfect opportunity for home sellers, if they’re marketed properly. If you’re a buyer, scoring a home right now can be tough. There are several buyers looking for similar listings and not enough to go around. You can call the Ellis Team and speak with our buyer specialists who are experts at making offers look more attractive than other competing offers to the seller. This can be the difference between buying your 1st choice or settling for your 5th choice, if there even is a 5th choice. Many times there are just a few homes that meet your needs on the market. In a race against other buyers, speed wins. I’d recommend searching at www.LeeCountyOnline.com Our database has the entire MLS, and is updated every few minutes. Don’t waste time using sites that don’t have accurate or timely data. We get calls all the time from frustrated buyers who see something on a big website only to found out it was sold months ago. Always call the Ellis Team at Keller Williams Realty Fort Myers & The Islands. 239-489-4042. We’re here to help. Posted in Cape Coral, Cape Coral Real Estate, Fort Myers, Fort Myers Beach, Fort Myers Real Estate, Gated Community, Open House, Southwest Florida Real Estate.Tagged Bell Tower Park Open House, Ellis Team Weekend Open Houses, Hurricane Irma, Keller Williams Realty Fort Myers & The Islands, Olde Hickory Open House, Opportunity to Sell SW Florida Real Estate After Hurricane Irma, Thinking of Selling.